In C language, arrays are referred to as structured data types. 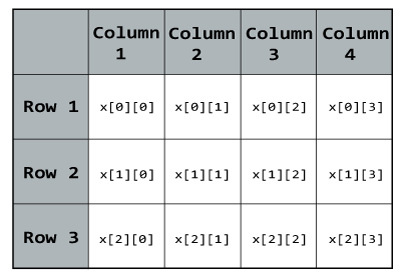 An array is a collection of data that holds fixed number of values of same type. An array is defined as finite ordered collection of homogenous data, stored in contiguous memory locations. finite means data range must be defined. ordered means data must be stored in continuous memory addresses. homogenous means data must be of similar data type. For example: if you want to store marks of 100 students, you can create an array for it. How to declare an array in C? You can access elements of an array by indices. Suppose the starting address of mark is 2120d. Then, the next address, a, will be 2124d, address of a will be 2128d and so on. It's because the size of a float is 4 bytes. How to initialize an array in C programming? After an array is declared it must be initialized. Otherwise, it will contain garbage value(any random value). An array can be initialized at either compile time or at runtime. One important thing to remember is that when you will give more initializer(array elements) than declared array size than the compiler will give an error. Here, x is a two-dimensional (2d) array. The array can hold 12 elements. You can think the array as table with 3 row and each row has 4 column. Here,The array y can hold 24 elements. You can think this example as: Each 2 elements have 4 elements, which makes 8 elements and each 8 elements can have 3 elements. Hence, the total number of elements is 24. How to initialize a multidimensional array? There is more than one way to initialize a multidimensional array. Initialization of a two dimensional array. Above code are three different ways to initialize a two dimensional arrays. Initialization of a three dimensional array. // C program to store temperature of two cities for a week and display it. C program to find the sum of two matrices of order 2*2 using multidimensional arrays. LearnFrenzy provides you lots of fully solved "C Programming Array" Questions and Answers with explanation.